Good news: Josh Hamilton is back. 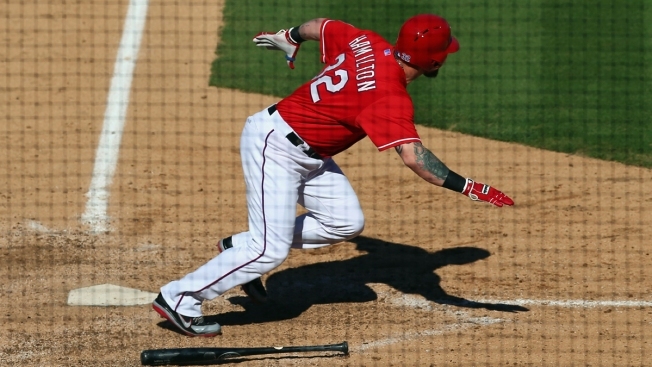 Bad news: Josh Hamilton may never be back. There’s a reason the Angels were so ready to give up on the former MVP. First, he’s lost his “fastball.” Secondly, his body is breaking down. Since acquiring him early in the season, the Rangers have gotten doses of each. Hamilton has shown flashes, but he’s suffered more injuries than produced big hits. He’ll return Tuesday from his latest stint on the disabled list – this time a knee – but if the Rangers are smart they won’t put him in the outfield again this season. Pinch-hit? Sure. DH? Absolutely. But Hamilton’s full-speed running should be used for quality over quantity, like going 1st to 3rd on a single in the playoffs rather than chasing a double into the left-field gap in early September. The Rangers seem to be thinking correctly on this. When Hamilton returns Tuesday in San Diego he’ll likely be a PH/DH. Injuries have limited him to only 38 games this season. He’s already undergone two surgeries on each knee, and is contemplating another off-season operation to repair cartilage in the sore knee. His declining health is one of the reasons I didn’t attend the parade when the Rangers reacquired him. He’s no longer the five-time All-Star whose five tools led the Rangers to consecutive World Series. He’s now the old veteran role player, reduced to hitting .254 with six homers and 21 RBI. Hamilton can still help the Rangers. But like everything else in his life, his production now must be carefully managed. Moderation … or else.